The street market in Barcelona, close to the cathedral, was buzzing with mid-afternoon crowds. 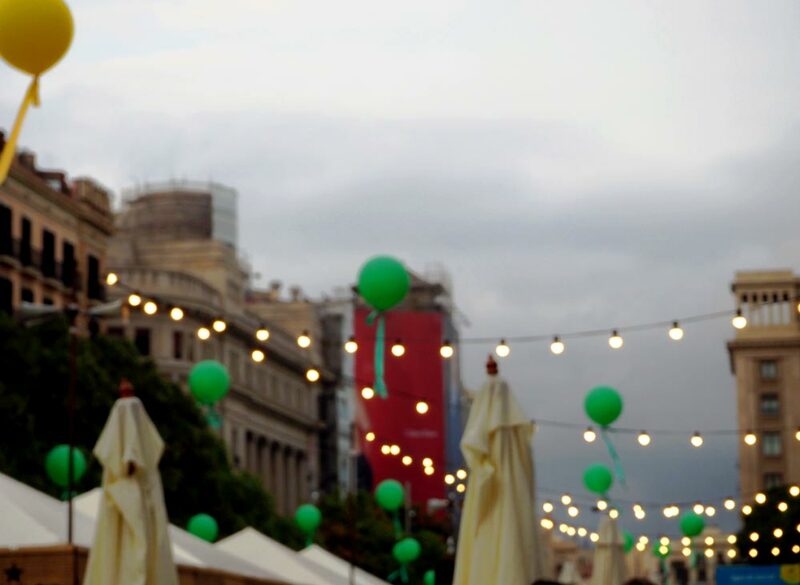 Fairy lights and coloured balloons created a party atmosphere and the throb of the Barcelona street drummers, the whistles and cheers of the crowd, all added to the ambience. You could hear and smell this place before you arrived. 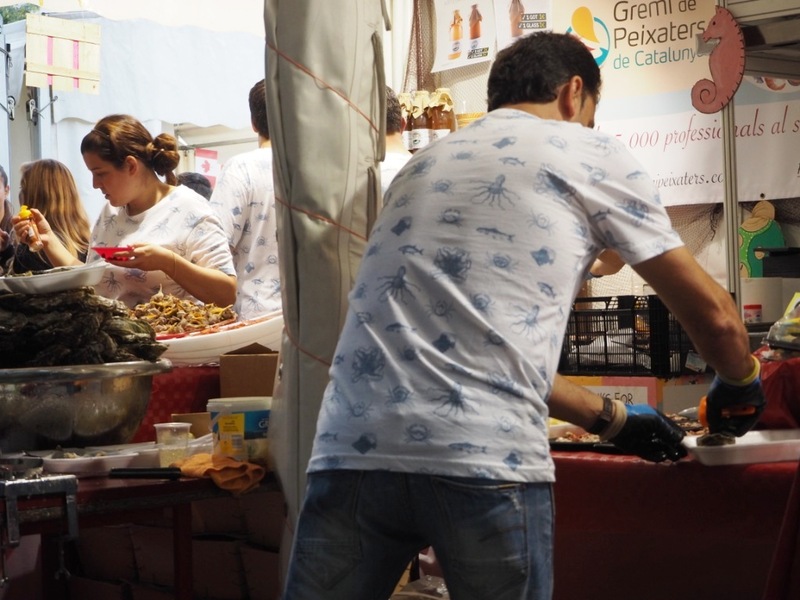 We came across the food market accidentally, but so glad we did! There is nothing better than a good surprise. I’ve never tried a macaroon either, nearly two quid for two little biscuits squashed together, whatever next! Like you , I love markets, there was a book fair near the cathedral when I was there. Did the birthday girl like Barcelona? She loved it – though I noticed in a comment on her FB page that “mom likes to walk… a LOT” and there was I thinking SHE was the one dragging ME around 😀 We decided that we should have a weekend away every two years we loved it so much. Next one Seville. Goodie!Daughters are great aren’t they? Mine came to Marrakech a with me a few years ago, but the next trip will have to wait until the girls are a bit older. I went to Seville for a day when I was in Tavira, loved it but having so little time was frustrating. Have a lovely day honey! You too! Grey and windy here. Great shots. I am going to Barcelona for the first time in April. How exciting! It’s a great city. Glad you approve 🙂 Now you need to find yourself a market. A great feel for (of?) the Barcelona market and all its goodies. That first stallholder looks as if he could moonlight with the bulls. Is that real or mock newsprint round the calamari? I remember being disappointed years ago when I was planning a romantic feast by the sea of champagne and fish and chips in newspaper: newsprint had been replaced by butchers paper for health reasons. Fake newsprint I’m afraid Meg. The days of wrapping our chips and fish (A Sheffield expression) are long gone, as are many of the actual printed newspapers. Wrapped in a website doesn’t quite cut it! Like virtual food – looks good but no smell! Gorgeous shots; especially the food! So much food and so beautifully displayed too! 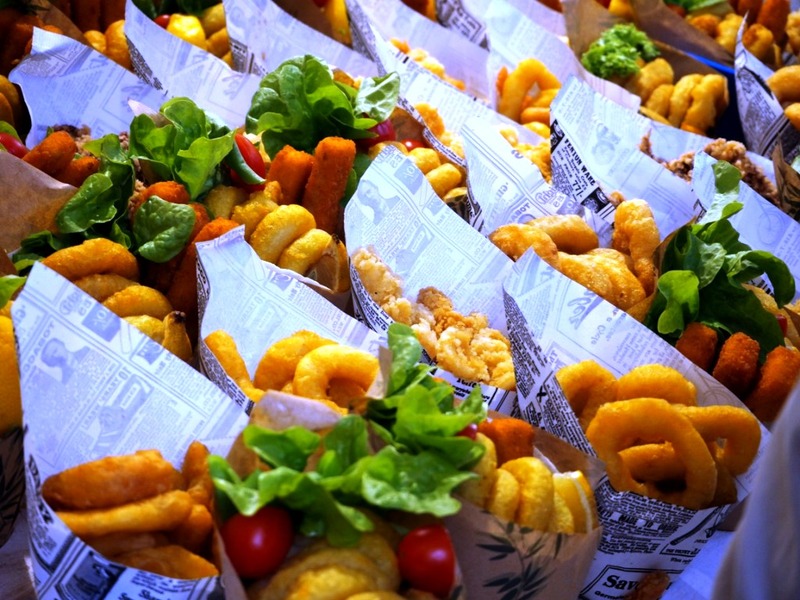 The calamari looks delicious. I wanted to reach into the screen for some. 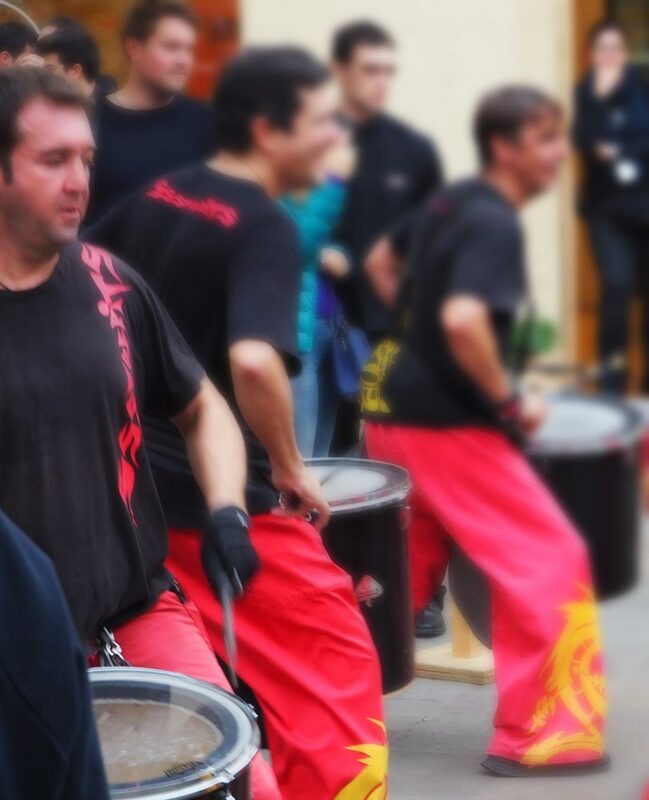 The blurred drummers is a great shot! The drummers were what drew us to the square. They were excellent. Oh my, Barcelona is one of my favorite places anywhere – a wonderful city with fabulous ambiance – you’ve captured it beautifully Jude! Thank you Tina. It is an incredible city and I totally fell in love with it. I think it has even dislodged Paris in to second place. Fortunately since we were staying in a hotel there was no excuse to indulge in buying too much, but we did cobble up an excellent lunch on the hoof. I guess we are spoiled for farmer’s markets here (though not many in the south-west) so I don’t bother with a lot of things. I should have bought some olive oil though. We’re spoiled too but I can’t help myself – I always bring back a taste of wherever I’ve been in the form of food lol. This looks like my kind of place! I love street markets! I forget what it is we were going to do, but when we heard the drummers we were drawn in their direction. Haven’t seen any of the Australian on terrestrial TV – they may show the final if Murray makes it that far. Radio 5 Live broadcasts and I believe BBC 2 may show highlights next week. You will have to keep me posted! I want to step into my computer screen and walk through this market! It looks amazing! It was Jo, so much to eat and so cheap too. We had such fun concocting a three course meal from what was on offer. Maybe he is the one in Melbourne – DJ posted some photos of macarons that looked rather special. Adriano Zumbo is the one I’m talking about. He has stores in Melbourne and Sydney. http://zumbo.com.au/ His cakes are to die for…I should know, I’ve eaten plenty of them. 🙂 I make a point of going to his Emporium store when we go to Melbourne. The macarons on DJ’s post look pretty special too.